This year Victorinox teamed up with Kazuma Yamagucki, a designer in Japan to create a rainbow of new knives. 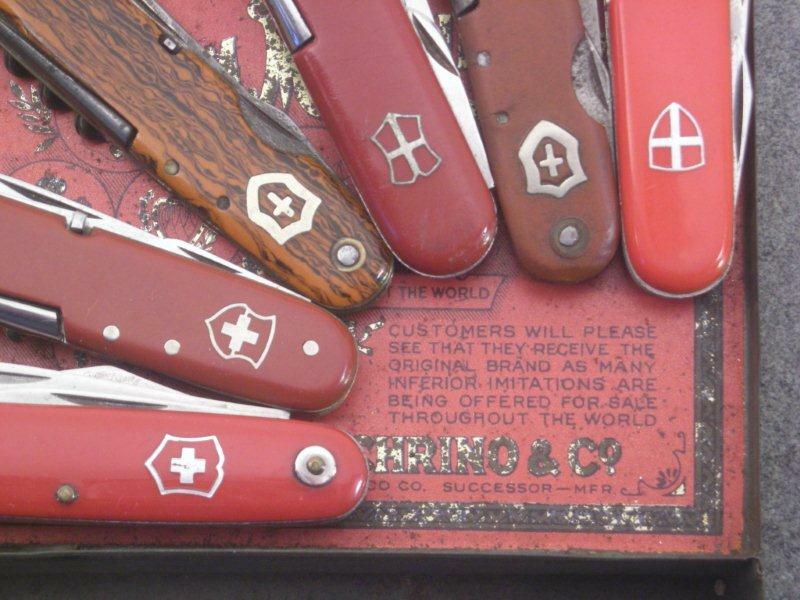 All models are the same, basically a new slant on the Victorinox Classic. This year Victorinox announced the new Slim and Slim Duo models, which are basically upgrades to the old SwissMemory line. While I had some issues with the previous line, I see a lot more potential with the new Slim models as the price is expected to be a lot more reasonable and the drive capacities are more impressive. At this year’s SHOT Show I was once again able to build another SAK. It seems that I am developing quite a collection of factory authorized SAKs, made by me- with a little help from this SAK building machine from Victorinox! Welcome to the Red Shield years for the model 1961. 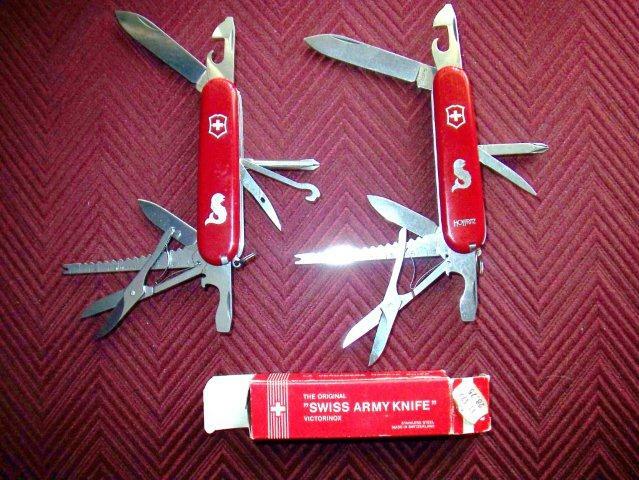 This is my third article in a series of three on the issued Swiss Army knives. The first two were about the red years and the non red shield years. This article will take us from 1977 until the end of the “marked” soldier knives in 1988 and beyond. 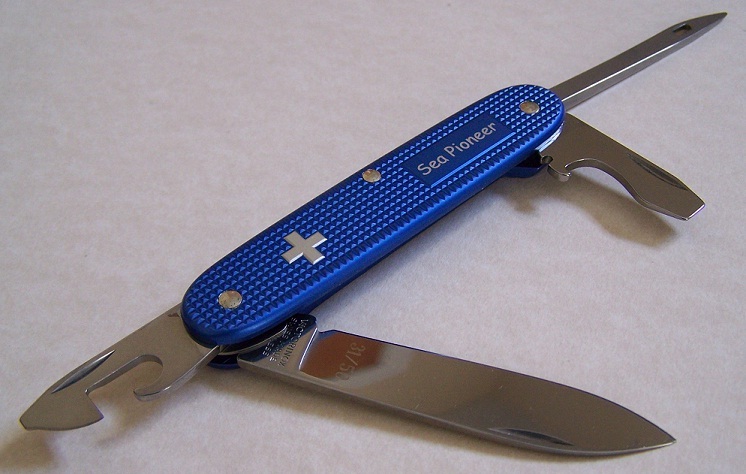 I just thought that members might like to consider this little 'unsung hero' from Victorinox. It may not look much, but it really works ! 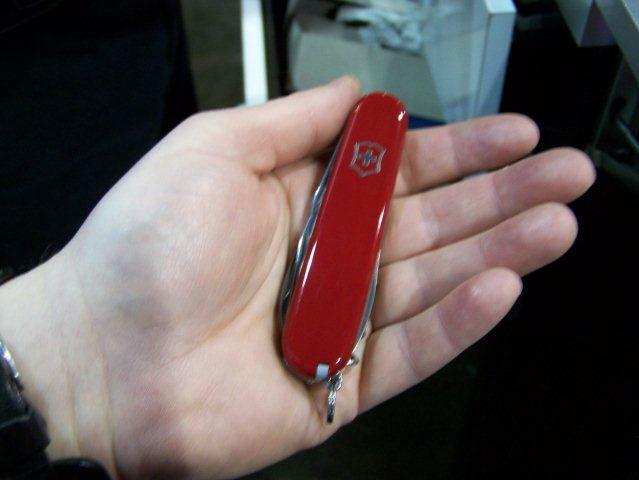 Back in the “good old days,” in the early 1970’s, I purchased a Victorinox Fisherman (SABI, 53541, Vic, 1.4733.72) at a Hoffritz store in Grand Central Station in Mid-Town Manhattan at 42nd Street. In those days, Hoffritz sold knives, scissors, various cutlery utensils, shaving accoutrements, and the like in various shops around the city, especially at train depots and airports for travelers, tourists, and road warriors. I recently returned to the location of the shop on the ground level of the Station near the Lexington Avenue exit, but it was no longer there. I guess the changed economy and security concerns put a serious crimp in their business. 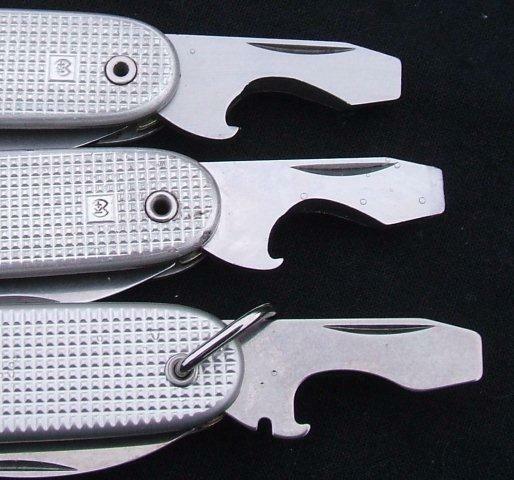 The Hoffritz’s Victorinox knives were especially made for sale by Hoffritz and do not carry the Victorinox name anywhere on the tool. The old on the right showing the inlaid metallic Hoffritz lettering and the aluminum head of the Tweezers, the new on the left with the grey plastic head of the Tweezers. Note the All-Purpose Hook, the Sewing Eye on the Reamer/Punch, and the round Phillips on the new. Ever wonder what some of the abbreviations you see in conjunction with some Swiss Army literature mean? Thanks to PTHYCRP, you can wonder no more! Here is a list of Swiss Army abbreviations for reference. I’ve got the Blues again this month, and I couldn’t be happier about it! Why is that? Simple- the Blue ALOX Sea Pioneer, this month’s addition to the ALOX Fan Club! Some time ago I published an article on removing scales from a SAK, and apparently it was either missed by most folks or wasn’t any good because the “what’s the best way to remove scales?” is still one of the most commonly asked questions, so I thought it was about time we revisited it.